I am a woman and the middle child squeezed between two brothers. We were all born in the mid to late fifties. There were a lot of shows on television at the time about perfect families like "Father Knows Best" and "Leave it to Beaver" that idealized what families of the day looked like. We lived in a very nice middle class neighborhood in a ranch style home. This was not our first home, but in this home I was at the age that I could recall events and could describe to you every room in the house. This is where we all predominantly went to grade school and my older brother started Junior High. Our dad always worked and always provided a nice home and furnishings. He always had a job and took care of all of our needs. Mom stayed home because that was the way dad wanted it and she was a terrific housewife because that is where she excelled. Those were the days when the housewives you saw on television were in dresses and pearls vacuuming the carpet and it was pretty close to true at my house as well. Maybe not the pearls but Mom was always in a dress. It all appears, as do the television programs, that on the surface we had the perfect family. But even though Dad took care of all the necessities of life he was and always has been emotionally unavailable. The only time you ever had conversations with my dad that I can remember was when you were in trouble. And that was not a time you wanted to talk to him, believe me. We were all pretty traumatized by Dad; every time we walked past him we would cringe and my oldest brother got to the place that he would duck and cover because he was always in trouble. As a girl I longed to be Daddy’s little girl. My dad was a salesman and a good one. He was sort of like Dr. Jekyll and Mr. Hyde when we were around other people. My mom and dad had couple friends that they would invite over for dinner on occasion. One of them had a little girl that was a few years younger than I was. I am not trying to be mean or vindictive but she was not a pretty little girl. My dad would pick her up and put her on his lap and be so sweet to her. I would look on and wonder what was wrong with me. I would go into the bathroom and look at myself in the mirror. All I would see was me, I did not know if I was pretty but I thought I must not be because Daddy does not think I am. Over the years I have had great difficulty in relationships because of my relationship with my dad. I never felt worthy of anyone’s love and would bend over backwards trying to please men to get them to love me. I was needy and hurt easily which was not a recipe for success in relationships. I set myself up to be hurt with men that were just like Dad because that is where my comfort zone was. I spent a lifetime doing everything I could to win Dad’s love and approval. My brothers were doing the same thing except that after awhile they became angry and had nothing to do with him. They were seeking his approval and I was seeking his love. My oldest brother and I were talking the other day about Dad. He passed away several years ago now. We were talking about the way he was with grades when we were growing up, if you got an A he would ask why you did not get an A plus. If you got a C or below you were grounded for the next semester, and we all pretty much stayed grounded. We shared the one time in our lives that Daddy ever said he was proud of us. My brother thought it would be when he graduated college or got his masters degree but it was not. I had some moments in my life when I thought he would break forth in praise but it did not come. My brother shared with me that Dad told him before he passed away what his proudest moment was and we looked at each other and kind of shrugged. In the middle of my brother’s Senior year of high school Dad had gotten a transfer. My brother was a star football player. After we moved it was horrible because we had moved south and it was not long after desegregation had taken place. It was absolutely awful for all of us but especially him. He got on a bus and went back to our home town and lived with some friends. He finished high school and never called home for help in any way. Dad had said he would not help but we all knew that anyway. Dad told him that this was the proudest he had ever been of him. Not the great accomplishments of his life, just that he never asked for help and he made it through high school. Don’t get me wrong, I can see it making a Dad proud but this typifies my Dad. Was your dad emotionally available or emotionally unavailable? Why or why not? 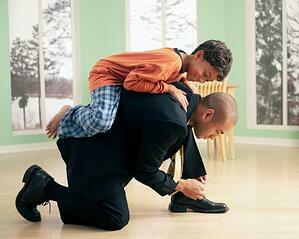 How has your dad's fathering shaped your view of parenting?